My first winter as a gardener and I’m learning all the time. So what have I learnt about winter? I’ve learnt that its a time to take stock of hardscaping projects and getting these done. As many plants die back or hibernate it seems to me one now has the space, time and because it is not so hot one also has more enthusiasm for diy. So whilst this is not quite as strenuous or ambitious as building your own raised bed garden, here is my diy project which finally got off the ground this week. 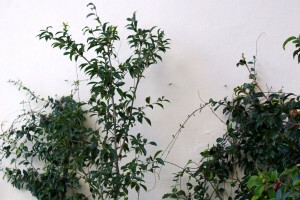 I have a number of Trachelospermum jasminoides ‘Star Jasmine’ (known as Confederate Jasmine in the Northern Hemisphere) that were planted by the landscaper last year. I never quite understood the objective of this planting as it is against the wall (good) but the plants are tightly wound around a stake (not good). 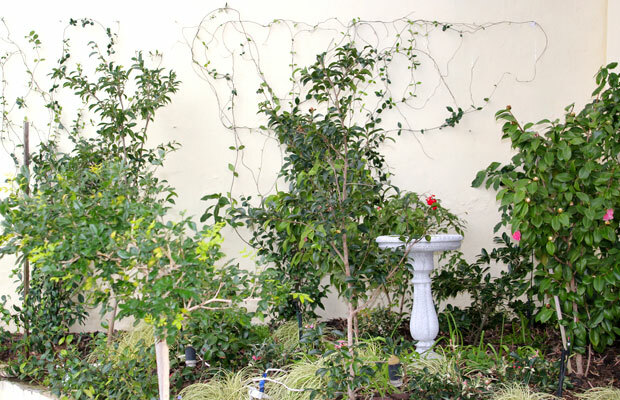 When I say tightly wound, I mean really tightly – the way they are sold at the nurseries (see photo on the left). 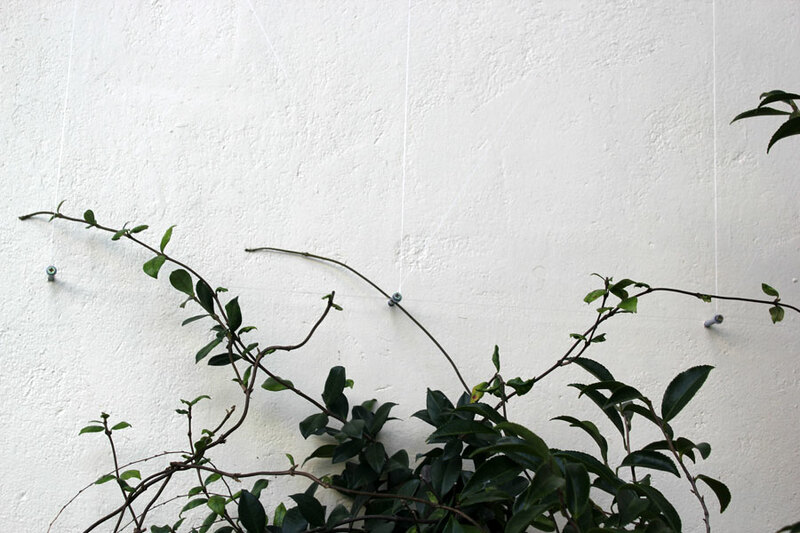 The plants had “nowhere to go” and as a result they were going nowhere – no light getting into the plant and they have just been “sitting” there, not flowering, not growing much either – just these weird plantings of “a stick with stems and leaves wrapped around them”. 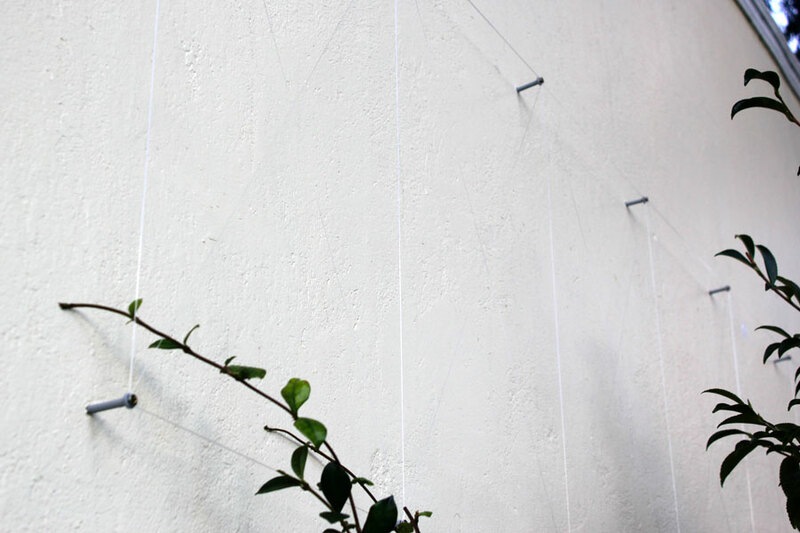 I realised that the solution would be a trellis so that I could unwind the plants from the stakes and “set them free” to do their thing. Actually, it was a blog post by Jess of the blog “Children of the Corm” that really inspired me to get my ‘a into g’ and get this done. (See her post here). Although her post is actually about her now famous statue, I just love her Star Jasmine that is the background to her lovely statue and I love how it grows there – perhaps when mine looks like that one day I might get a lovely statue for that area too. So here are the photos of before and after. 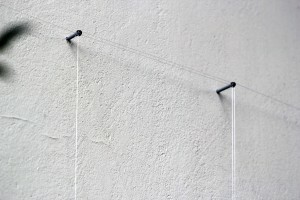 The line we used was fishing line chosen because it is transparent and very strong. From a distance (a few feet) you don’t notice the nails either. Once the plants have grown a bit I think we won’t see any nails. I have now unwound the plants from their stakes and guided them onto the new “trellises”. It was a bit like unravelling balls of wool that had become all tangled up. I managed not to break any stems in the process but it took a lot of care – at one stage I thought it would be much easier to just cut them all but then I would have little to train onto the new supports so I persevered and did the untangling with lots of love and care. You like? I do, I think it will look better given some time. How long do you think it will take for them to fill out? I do hope it will be soon. 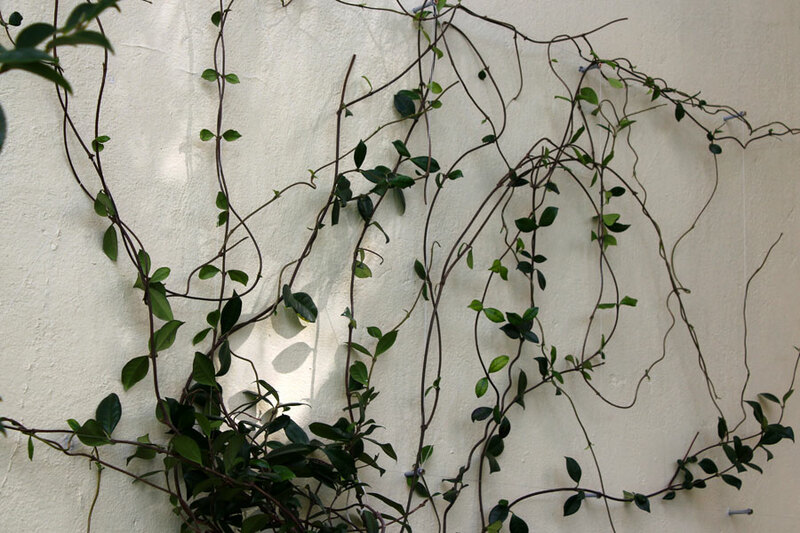 Star jasmine (Trachelospermum jasminoides) does have some self clinging ability but I’d not rely on it. Your trellis solution is far more effective. By coincidence I’ve just done something similar in my Plymouth (UK) garden. 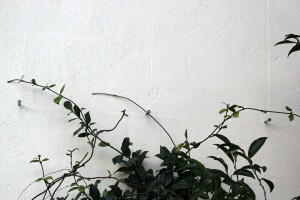 It’s in a small entrance way to the rear garden, potted because there is no soil at that point, and, after unwrapping from the plastic bindings that were holding it to a single cane, threaded through a home made trellis consisting of a fan of bamboo canes tied into to horizontal wires. The scent as you come into the rear garden is stunning – although Maria, my wife, says she can’t smell it! I’m looking forward to this Star jasmine taking off. I have smaller ones planted elsewhere – and I agree, the scent is stunning! But not over powering. I’d love to see photos of yours – I hope you show us on your blog some time? 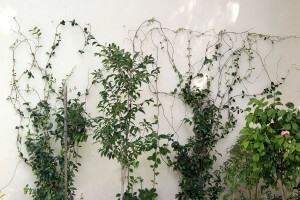 Your invisible trellis is a terrific idea, and I am sure your star jasmine will be much happier. Already it looks great. 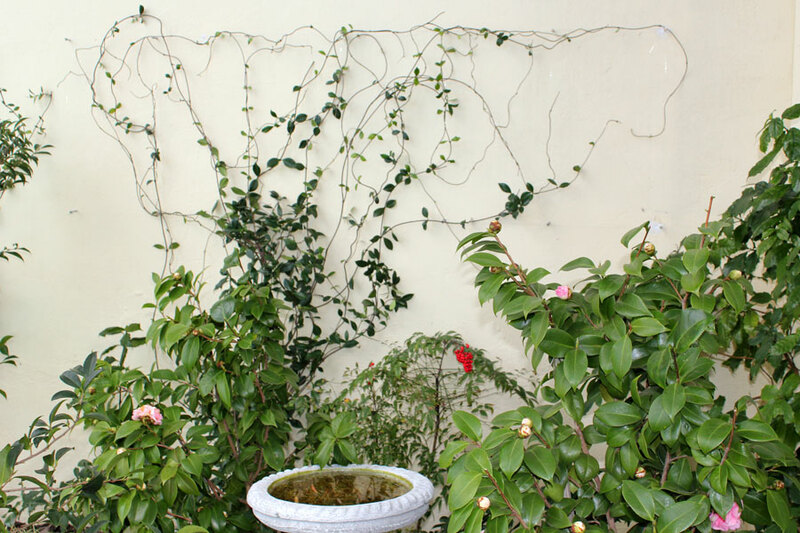 My star jasmine is growing on what was a rose arch, and it has taken over the arch and wants more. It really likes to spread out. Star jasmine is truly special when it blooms; I hope soon you will be enjoying its heavenly fragrance. Thanks Deb! I was apprehensive but I think it looks good – certainly better than they looked before and now they have space to spread out and grow! 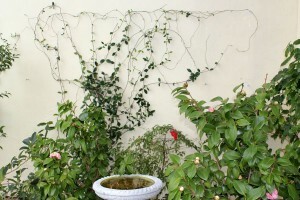 I’m going to see if I can see yours on your blog growing on the Rose Arch. I’d love to get one of those but am unsure where I could place it. Didn’t it just feel like a rescue? Well done! I love projects like that, where you do it yourself and it makes a huge difference. 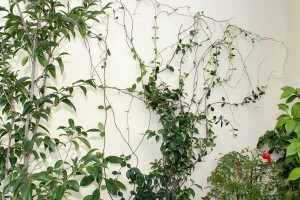 I adore jasmine and I know you will get blooms now, so fragrant. Mine is on the west end of my greenhouse and going over the top! Hi Linnie – it DID feel like a rescue! I can’t wait for mine to go over the top like yours! Nicely done, Christine. When it fills out against the wall, it’s going to be stunning! Thanks Cathy, I do hope so! Good point about doing hardscaping projects in winter, if the weather allows. 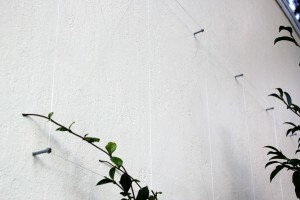 Your wall is going to look amazing filled in! Oh, well done, Chris! I am sure your Star Jasmines are going to kiss you for this. I would think that tangled stems have the same effect that crowded roots have for a plant. Total constriction! So this free them to have the energy to make beautiful blossoms. You must have lots of patience for that job!! Hi Barbie – I can’t wait for them to fill up the trellis a bit. They are so gorgeous in spring when they flower – I think it will look and smell gorgeous come spring. Christine, I like your ‘invisible’ trellis. 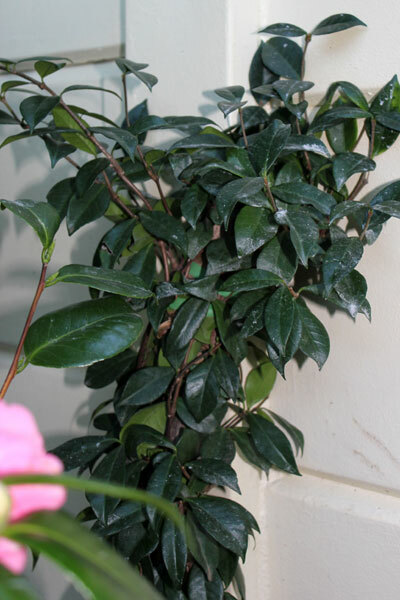 I have one potted star jasmine that is quickly growing taller than me. I may steal your idea, but plant mine, pot and all, in the ground. I am not sure what to do with it for winter, other than cut it back drastically and bring it indoors. Poor thing, but I do love the fragrance.